Traditionally, conventional periapical radiology formed the backbone of endodontics for diagnosis, treatment planning, and management. One of the major associated gripes being the technique created two-dimensional images of three-dimensional (3D) structures, suffered magnification, superimposition, and distortion, leading to compromised diagnostic information. The need to analyze the area of interest in all the possible planes led to the introduction of cone-beam computed tomography (CBCT), a novel modality specifically designed to produce precise, undistorted 3D reconstructed images of the maxillofacial skeleton. CBCT is increasingly being embraced by various fields in dentistry, remarkably in endodontic practice. 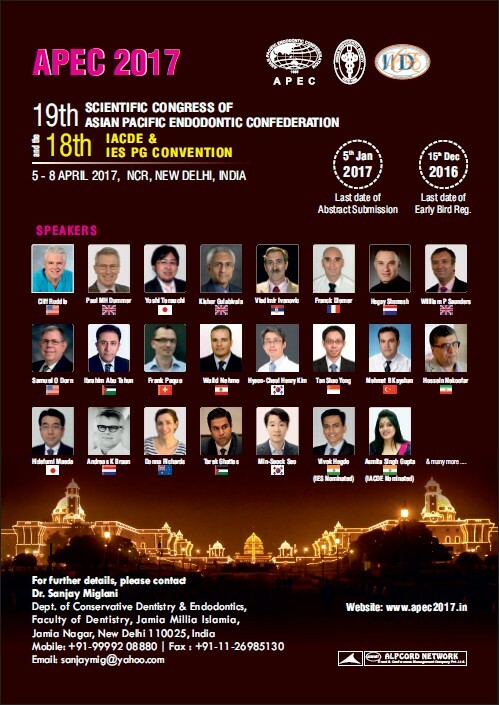 A systematic literature-based and book-based review was conducted using the keywords “CBCT in endodontics” and “endodontic applications of CBCT.” This article hereby discusses the prospects of CBCT in endodontics with an emphasis on its application in diagnosis and management along with treatment outcome assessment. Aim: The aim of this study is to compare the root canal shaping ability of two reciprocating instruments: WaveOne and Reciproc versus two rotary instruments – ProTaper Universal (PTU) and Mtwo. Materials and Methods: A total of 160 simulated root canals in resin blocks were constructed with two curvatures located at two positions creating four different combinations: 20°/8 mm, 20°/12 mm, 40°/8 mm, and 40°/12 mm. Canals were prepared using continuous rotation (PTU and Mtwo) or reciprocating (WaveOne and Reciproc) instruments according to the manufacturer's recommendations. Each system was used to prepare 10 canals of each shape. Each file or a set of files was used to prepare one canal. Using Image Analysis Software, pre- and post-instrumentation matching images were superimposed and analyzed for canal width and transportation. Instrument fractures, time of preparation, and change in working length were also recorded. The effect of instrument and canal type on shaping ability were analyzed using two-way ANOVA test followed by post hoc Pearson Chi-square test and sum of squares test at level of significance 5%. Results: The largest mean canal width and transportation values were associated with the Mtwo system (P < 0.001) and 40°/8 mm canals (P < 0.001). Canal aberrations were limited to rotary instruments mainly in canals with 40° curves. The reciprocating instruments prepared canals significantly faster than continuous rotation systems (P < 0.001). Conclusions: Continuous rotation and reciprocating files were safe and maintained the original canal anatomy. However, continuous rotation instruments have a higher tendency for canals transportation and aberrations, especially with larger curvatures. Reciprocating files were faster than continuous rotation files in shaping simulated root canals in resin blocks. Aim: To evaluate the effect of 17% ethylenediaminetetraacetic acid (EDTA) and 7% maleic acid (MA) irrigation on microleakage of mineral trioxide aggregate (MTA) and Biodentine® (BD) when used as a root-end filling material. Materials and Methods: Sixty human anterior teeth were decoronated and subjected to root canal instrumentation. 3 mm of apical root portion was resected, and root-end cavities were prepared using ultrasonic tips. Teeth were then randomly divided into two groups (n = 30). Group 1 - root end cavity to be filled with MTA; Group 2 - root end cavity to be filled with BD. Each group was further divided into three subgroups A, B, and C based on irrigation regimen. Group A - 17% EDTA; Group B - 7% MA; Group C - 0.9% saline. About 5 mL of all irrigating solutions were used for 1 min. After final irrigation, root-end cavities were filled with respective root end filling material. Specimens were then subjected to microleakage analysis at 24 h, 7 days and 14 days using glucose filtration technique. 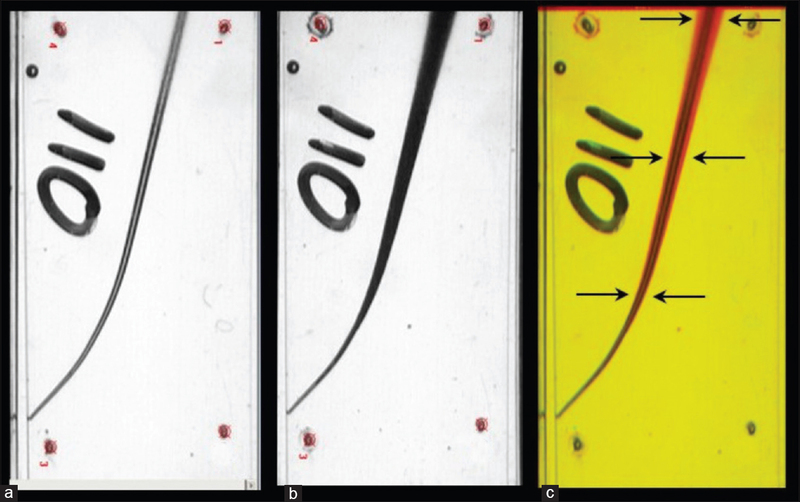 For smear layer evaluation, six central incisors were subjected to root canal instrumentation and irrigation with 7% MA and 17% EDTA. Then, these samples were analyzed under the standard error of the mean data was analyzed using one-way ANOVA, Bonferroni test, Mann–Whitney U-test and Kruskal–Wallis test. Results: Saline group demonstrated significant higher leakage than that of 17% EDTA and 7% MA in both MTA and BD groups. However, there was no significant difference between 17% EDTA and 7% MA group when MTA was used as root-end filling material. In BD group, 17% EDTA showed more leakage than 7% MA. 7% MA was able to remove the smear layer better than 17% EDTA. Conclusion: MTA had a better sealing ability as compared to that of BD when root-end cavities were irrigated with 7% MA. Introduction: Root biomodifying agents are adjuncts to periodontal regeneration. Aim: This study evaluates the demineralization effect of a chelating agent, maleic acid (MA) when used as a root biomodifier on the cemental surface. 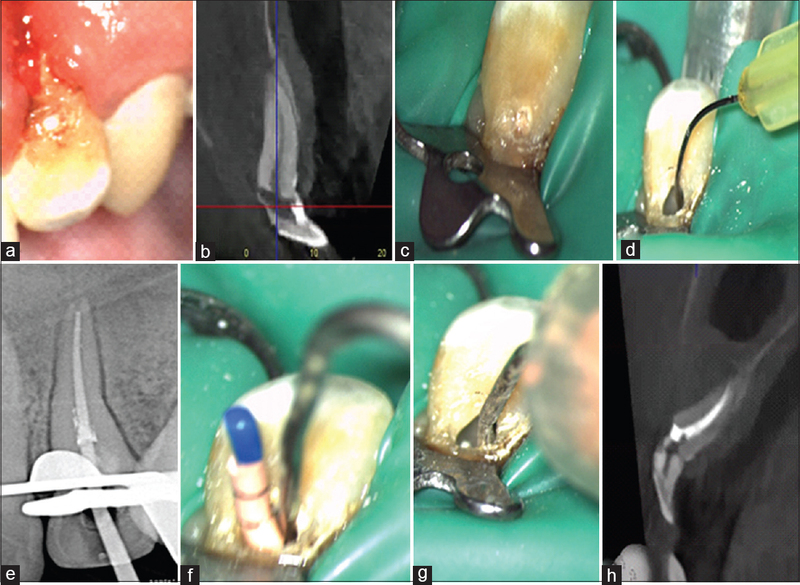 Materials and Methods: Thirty single-rooted anterior teeth were selected for this study. The teeth were decoronated and split longitudinally to form sixty radicular halves. They were randomly assigned to four groups of 15 fragments each according to the demineralizing agents used and treatment time of 1 and 3 min. Group 1 treated with 50% citric acid (CA) solution at pH 1, Group 2 treated with 17% ethylenediaminetetraacetic acid (EDTA) solution at pH 7. Group 3 treated with 7% MA at pH 1.3 and Group 4 treated with saline. The specimens were then prepared to view under scanning electron microscopy (SEM). To study the adherence of cells on the root surface, human periodontal ligament cells were cultured and were placed in plates containing root halves, and cell adherence was viewed using SEM. The data were statistically analyzed by Pearson's Chi-square test (χ2) to evaluate the effect of the each test agent. A significance level was set at P< 0.05. Results: All the three test agents were successful in eliminating smear layer at both time intervals. Intergroup comparison at both time intervals demonstrated, MA to have a better smear layer removal ability than CA and EDTA. Conclusion: This particular study provided preliminary evidence on the demineralizing effect of 7% MA when used as a root conditioning agent. Objective: This study aimed to investigate the bactericidal effect of silver nanoparticles (AgNPs) in reducing bacterial infection in root canal when used as intracanal medicament alone or in addition to the conventionally used calcium hydroxide (Ca(OH)2). Materials and Methods: The root canals of 110 single-rooted teeth were cleaned, shaped, and sterilized. All groups, except for negative control, were inoculated with Enterococcus faecalis for 48 h. Then, teeth were divided into five groups according to the intracanal medicaments to be used. Group I (n = 30): Ca(OH)2. Group II (n = 30): AgNP. Group III (n = 30): AgNP + Ca(OH)2. Group IV (n = 10) was used as a positive control where the root canals were inoculated with E. faecalis and left without treatment. Group V (n = 10) was used as a negative control where the root canals were checked for the absence of bacterial growth. Specimens were incubated for 1 and 2 weeks. Pre- and post-medication samples were obtained by paper points, and the colony-forming units were counted. Results: Ca(OH)2 resulted in a higher percentage of bacterial reduction in both 1 and 2 weeks of application (81.5% and 98%, respectively). AgNP was ineffective against E. faecalis with 32.9% bacterial reduction in 1 week and 56.5% after 2 weeks. 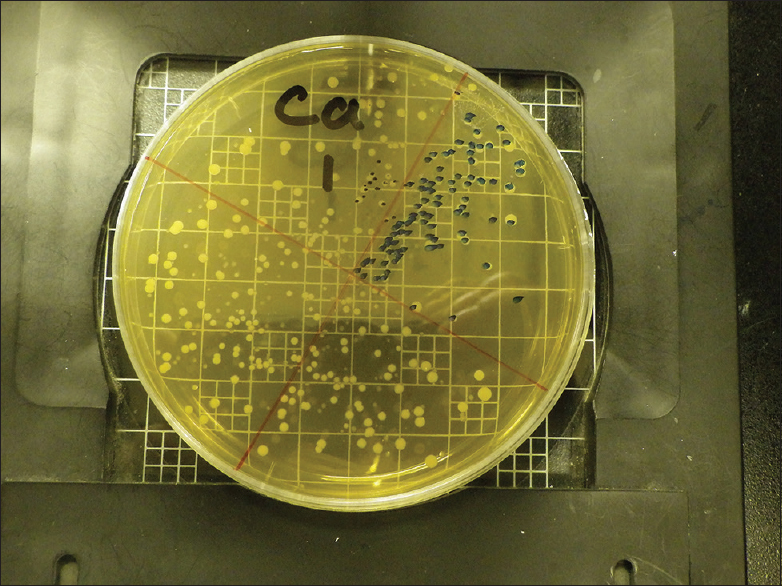 Conclusion: It was concluded that the antibacterial effect of AgNP was lower than Ca(OH)2 or combination of both materials. Aim: The present study was aimed to assess and compare the human pulp dissolution capacity of sodium hypochlorite (NaOCl) (2.5%) and garlic extract. Materials and Methods: Several pulp tissues are obtained from both endodontically treated teeth and also by orthodontically extracted premolar teeth and were sectioned with a surgical blade into seventy-five pieces of same size and weight. Pulp tissues were then divided into Allium sativum extract (ASE) group, NaOCl group, and NaCl group and tissues were immersed in the test solutions for 30, 60, and 90 min, respectively. Further tissues were weighed using a precision balance at tested intervals, and the percentage weight loss was calculated and statistically analyzed. 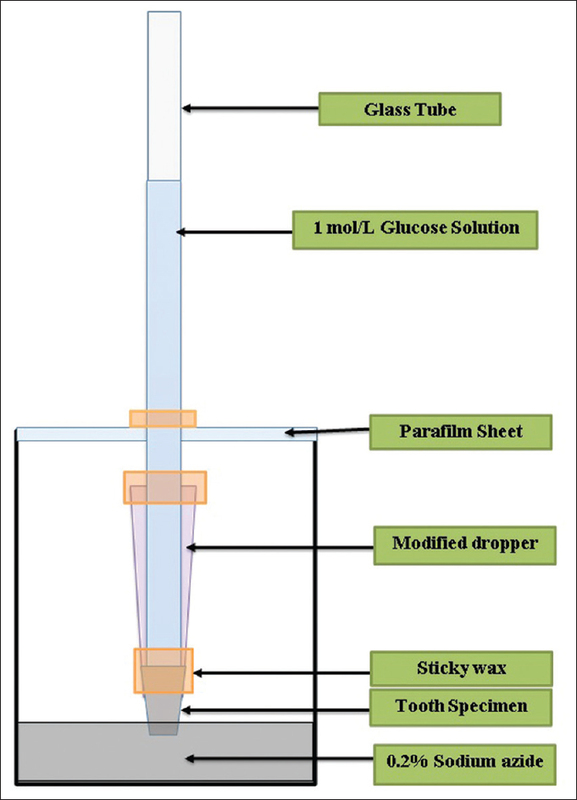 Results: In this study, pulp tissue treated with 2.5% NaOCl solution at all tested time intervals showed significant (P < 0.001) pulp tissue dissolution capacity and a maximum of dissolution was observed at 90 min. Pulp tissue treated with ASE showed little dissolution ability at all tested time periods. Whereas, 0.9% NaCl showed no ability to dissolve human pulp tissue. Conclusion: It can be concluded that 2.5% NaOCl had the maximum tissue dissolving capacity when compared to different concentrations of ASE. Saline had no effect on the human pulp dissolution. Two cases of traumatized permanent maxillary central incisors with complicated crown fractures of young patients are reported. Partial pulpotomy by Cvek technique was performed using mineral trioxide aggregate filling material. The tooth fragment was reattached to the tooth structure with composite resin. Follow-up revealed normal pulpal response, complete apical closer, and dentin bridge formation. The present case report shows a 23-year-old male who was subjected to trauma in his maxillary right central and lateral incisors with crown and transverse apical third root fractures. Root canal therapy was started, but the patient did not complete it. After 6 years, the patient was subjected to another trauma on the same teeth and showed up after 3 weeks of the second trauma to continue his treatment. Clinical examination revealed that both incisors were sensitive to percussion and palpation with labial sinus tract and pus discharge through the open access cavity of the central incisor. 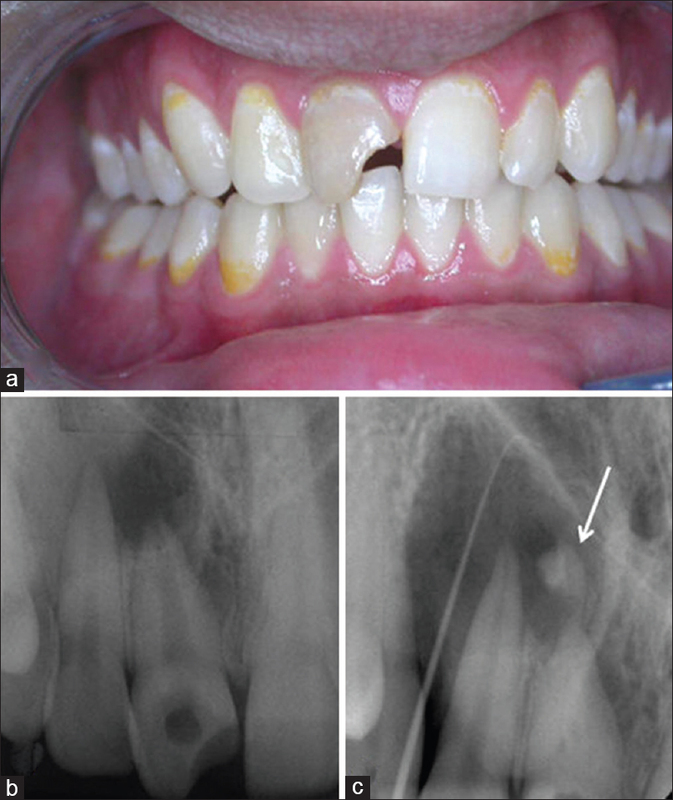 Radiographic evaluation demonstrated root fracture of the central incisor with large radiolucency. Root canal treatment for both incisors and periradicular surgery was done. Histopathologic examination of the periapical lesion demonstrated tissue necrosis and fungal hyphae. Follow-up showed no symptoms with good healing. The treatment modality appears to be effective in dealing with delayed management of traumatized anterior teeth. Anterior teeth may have aberrant anatomical variations in the roots and root canals. Root dilaceration is an anomaly characterized by the displacement of the root of a tooth from its normal alignment with the crown which may be a consequence of injury during tooth development. 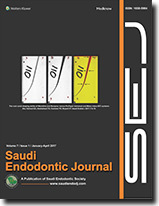 This report aims to present a successful root canal treatment of a maxillary lateral incisor with unusual palatal root dilaceration (diagnosed with cone beam computed tomography) in which the access cavity was prepared from the labial aspect of the tooth to provide a straight line access to the root canal system which was instrumented using OneShape rotary file system and precurved K-files up to size 50 under copious irrigation of 2.5% NaOCl using a side-vented irrigation tip. The canal was then obturated using the warm vertical compaction technique. 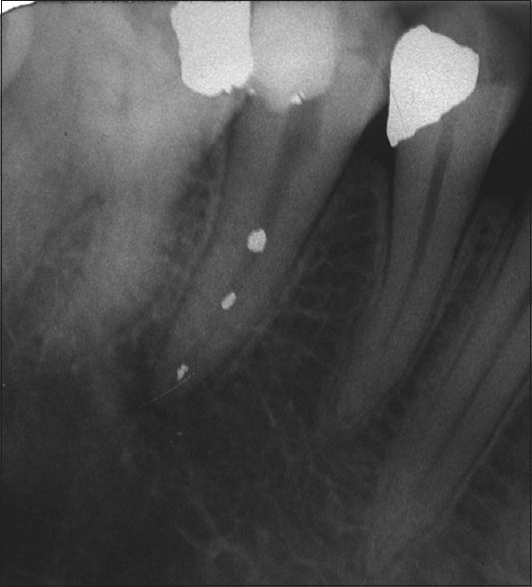 Metallic obstructions in the root canal space render its removal or negotiation by-passing one of the most challenging procedures encountered in the endodontic retreatment which may jeopardize the tooth structures, several procedures had been advocated. In this case, due to limited available equipment negotiating these obstructions by passive and conservative approach had been implemented.